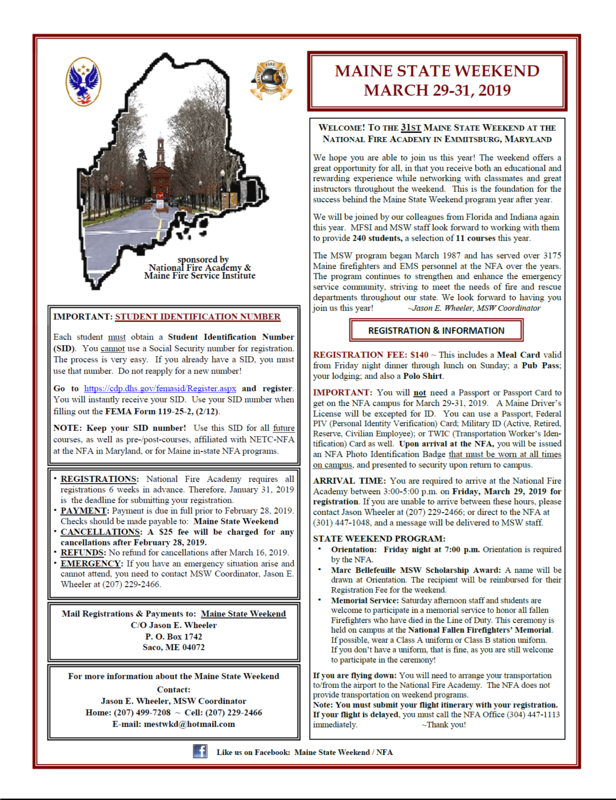 The 2019 Maine State Weekend Program at the National Fire Academy in Emmitsburg, Maryland will take place on March 29-31, 2019. This will mark the 31st Maine State Weekend held at the National Fire Academy. We will be joined by our colleagues from Florida and Indiana again this year. There are 11 courses offered this year and accommodations for 240 students for the weekend program from all three states. EXTREMEY IMPORTANT! A current / valid Maine Driver’s license is all that is required for admission on to the NFA Campus for the Weekend Program. The NFA requires that all students who register obtain a SID (Student Identification Number) that you will use in place of your social security number. If you do not already have an SID, the process is very easy! The link is mentioned in the brochure, but I am attaching it here as well.https://cdp.dhs.gov/femasid/Register.aspx ~ you just click on this link and it will take you directly to the page where you will fill in your name and information. Then click the submit button at the bottom of that page and you will instantly receive your SID number in your email. It is that easy! If you already have an SID….. use that number….., DO NOT SUBMIT FOR A NEW SID NUMBER. Use your SID number on the FEMA (short form 119-25-2) application that needs to be signed and submitted along with your signed Maine registration form. Please use the attached FEMA form; it is a fillable pdf. 3. IMPORTANT NOTE ABOUT FLYING: If you are planning on flying down to the National Fire Academy for the Maine Weekend Program, please note that the NFA NO LONGER provides ground transportation from and to the airport. You will need to arrange your own transportation both ways. If you are flying, you still need to submit your flight itinerary to me with your registration. Any questions, please contact me. Please submit all (completed and signed) application forms (Maine Registration, FEMA Short Form, and Lahaie Scholarship by January 31, 2019. Payment by check or Money Order must be received by February 28, 2019. Be sure to indicate course selections in numeric order of choice on your application, (minimally your first three choices), as your first choice may be filled by the time your registration is received for processing. Please feel free to copy and post the brochure and forms at your respective stations, and or forward this email with the attached PDF documents to all Maine Firefighters and EMS personnel you may have in your contact list. We have the opportunity to accommodate 240 participants, and it would be great to see Maine, Florida & Indiana fill all 240 available accommodations this year! If you have any questions, feel free to contact me at mestwkd@hotmail.com or call (207)229-2466. As always, I thank you for your support; and I look forward to seeing you in March.